With the Christmas decs finally packed away now is the best time to get your creative juices flowing. 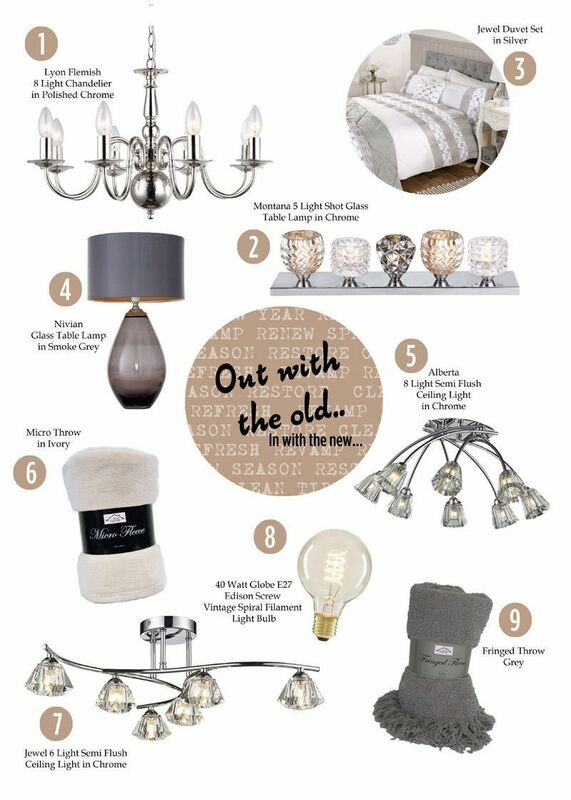 Make the most of the New Year by planning a makeover, restore order in the home or simply add some new accessories. The new year brings new beginnings, a fresh revamp or a spring clean. Think about de-cluttering your home to give an airy easy approach or choose a new look by replacing old accessories with some new finds. Adding some new key items such as a new table lamp, coffee table, ornament or a new cushion will instantly lift your room, giving the illusion of a makeover, when really it’s just a little revamp. A statement table lamp sat on a side table will help draw the eye when guests visit. Table lamps, especially fabric shade styles can sometimes become grubby and lose their colour as they collect dust over time which can be hard to remove. A simple solution would be to replace the shade. But why not treat yourself to a new fitting for the New Year. A table lamp with a bulbous, unusual base or a patterned shade can double up as an ornament or feature. Our old faithful Teapot Chrome Table Lamp can add a fun and frivolous touch to your home, think mad hatters tea party meets old English tea room. Our Nivian Glass Table Lamp in Smoke Grey adds a more sophisticated vibe with it’s vase-like bulbous base. For a more adventurous addition take a look at our Montana 5 Light Shot Glass Table Lamp in Chrome. One of our newest lines has already created some buzz in the Litecraft HQ offices with it’s unusual design. 5 crystal cut shot glass inspired shades sit a top a slim chrome plaque base. Each glass features either a smoked, champagne of clear finish which creates a mixture of differing tones when lit. If you’re after a more traditional fabric shade table lamp then have a look at our Carly Table Lamp with Flocked Damask Shade in Chrome or our Devon Glass Ball Table Lamp. Both these ranges feature a stylish base with our Carly Range boasting a subtle cream flocked pattern on the shade. Adding a simple ceiling fitting with a more contemporary design will instantly lift a room as well as creating a talking point for visitors. Our new lighting ranges will be available in the coming weeks but to ensure you get first priority, all our newbies are available to pre order, ready for your New Year makeover. Our new lines combine contemporary finishes with traditional designs such as our Lyon Flemish 8 Light Chandelier in Polished Chrome which features a sleek chrome finish on a traditional chandelier design, a bulbous central design completes the look. For a touch of sparkle check out our Alberta and Jewel Range. As well as boasting a sleek chrome finish, both ranges also feature chunky glass shades that allow the fitting to sparkle and shine when lit. Giving your room that extra wow factor. After the festive season your home can feel a little dull and unloved. If you’re after a freshen up but don’t want to break the bank then choosing some new soft furnishings is ideal. Scattering some plump new cushions and throws on seats and beds will dramatically open up your home giving it a new lease of life. For more luxury new bedding sets will transform your room like an instant facelift. Choosing a light and airy palette of whites and creams will help during the winter months when mornings are darker and it’s just that little bit harder to wake up. This choice of palette will give you that much needed lift in the morning and get you geared up for work. Choose from our extensive range of soft cream and white bedding for a more tranquil new season feel with designs such as our Jewel set which boasts sparkling sequin detail and a pleated ribbon trim on a sheet of white and silver.